Join us for Atlanta's holiday tradition. Rain or shine! 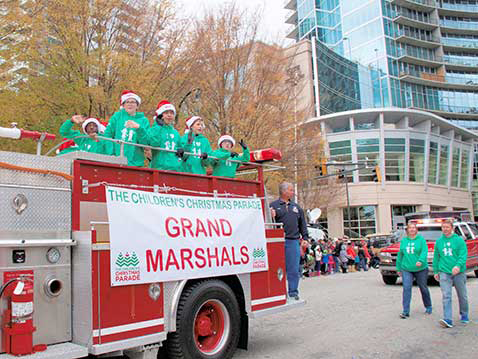 Join us for an Atlanta tradition at the Children's Healthcare of Atlanta Christmas Parade. 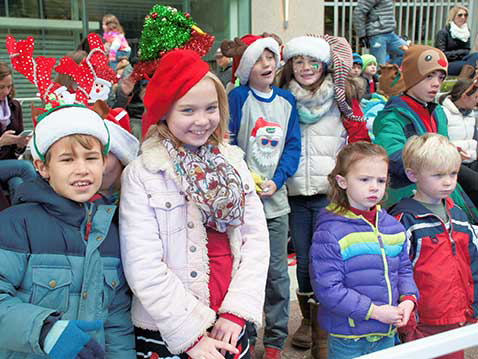 On Saturday, Dec. 7, rain or shine, the Children's Christmas Parade will begin at Peachtree and 16th streets at 10:20 a.m. and end at Peachtree and 5th streets. 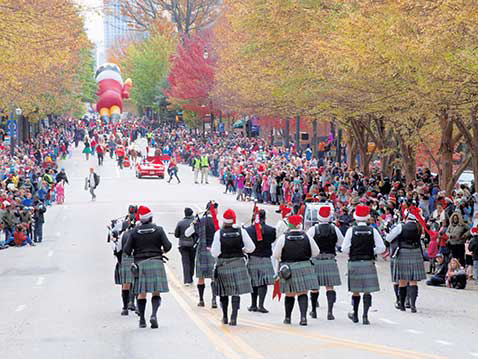 Watch as midtown Atlanta is transformed into Santa Claus Lane with the sights and sounds of the season. 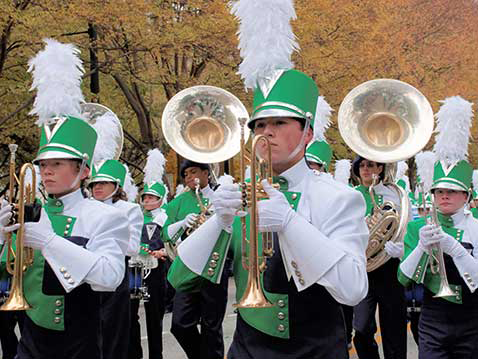 With floats, giant helium-filled balloons and marching bands, the Children's Christmas Parade is the largest holiday parade in the Southeast. Thousands of spectators will be lined up along the streets eagerly awaiting the arrival of Santa and the official beginning of the holiday season in Atlanta. Can't make it to Peachtree Street? 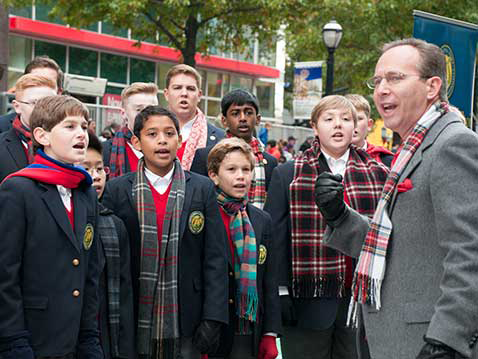 Tune in to WSB-TV Channel 2 to view the Children's Christmas Parade live. 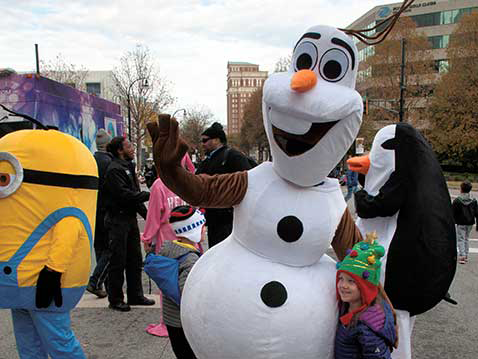 The parade will cross the TV zone at Peachtree and 11th streets at 10:30 a.m.
Two individual and unique breakfast events are offered prior to the parade’s start: Breakfast with Santa and the Smiles of the Season Breakfast. Breakfast with Santa takes place at the Four Seasons Atlanta Hotel at 8:30 a.m. on parade morning. Guests are served a buffet breakfast and enjoy special Christmas crafts and a visit from Santa and Mrs. Claus before they board their sleigh to ride down Peachtree Street. Breakfast with Santa guests will also receive bleacher tickets with their purchase. Bleacher tickets for the Breakfast with Santa event are located on Peachtree Street in the WSB-TV zone between 11th and 12th streets. The Smiles for the Season Breakfast takes place at 5Church Atlanta at 8:30 a.m. on parade morning. Guests are served a buffet breakfast and will enjoy special Christmas crafts and visits from characters. Characters include princesses, Christmas characters and more. Smiles for the Season Breakfast guests will also receive bleacher tickets with their purchase and a parking voucher for Colony Square. Bleacher tickets for the Smiles for the Season Breakfast event are located on Peachtree Street at 14th Street in front of Colony Square. The Smiles for the Season Breakfast does not include a visit from Santa and Mrs. Claus. *Please note that bleacher sections for the separate breakfast events are different; limited capacity. Bleacher seats take the stress out of finding a spot for your family and friends along the parade route. 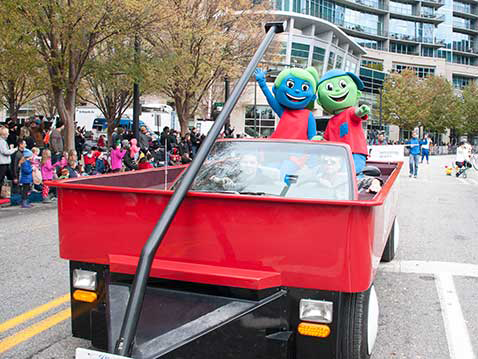 Bleacher seats are located on the parade route on Peachtree Street in the WSB-TV zone between 11th and 12th streets. Seats are general admission and not individually assigned. 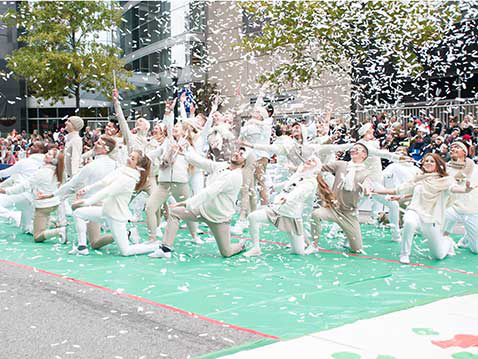 Performance and unique and entertaining groups are invited to apply for participation in the Children's Christmas Parade. Your participation will not only be a memorable experience, but also support a wonderful cause. Hundreds of dedicated volunteers help make the Parade a success. Volunteer positions are filled on a first come, first served basis. Please note that all general volunteer applicants must be at least 18 years old. Each year, the Distinguished Clown Corps, a group of Atlanta’s leading business executives, gather to march the parade route and make a difference by supporting Children’s Healthcare of Atlanta. 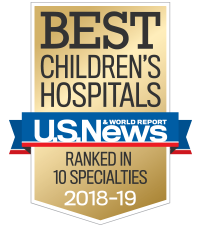 Please join us and become a Distinguished Clown or support your favorite clown’s efforts to raise money for the many children and families that walk through the doors of Children’s Healthcare of Atlanta. Is the Parade a rain or shine event? Yes. 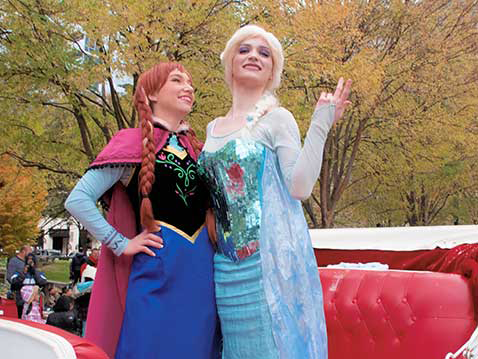 The Parade will go on rain or shine with the exception of extreme and dangerous weather conditions. Which streets will be closed for the Parade? Yes, there will be road closures during the Parade. We encourage all spectators to take MARTA. The Midtown and Arts Center stations are located along the Parade route. If you are considering driving, the Colony Square parking deck on 14th, the Campanile parking deck on Juniper, the Proscenium parking deck on Crescent and the Promenade II parking deck on 15th will be open. Rates will apply.